Matt Noakes has won a thrilling twenty lap main event during Round Six of the 2018/2019 Cranecorp WA Modified Sedan Series held last night at the Makit Hardware Narrogin Speedway. Noakes found a way past Calon Ball on the second last lap of the main event with the final laps seeing mutliple lead changes in what was a great exhibition of Modified Sedan racing. Eleven Modified Sedans were on hand for the penultimate round of this seasons series which doubled as the annual Holden vs Ford Stampede with Rick Musarra and Sandy Macpherson both out after hot laps with engine issues. Matt Noakes, Paul Stevens and Calon Ball took out three heat races, with Nathan Penn enjoying a consistent evening to be the highest point scorer heading into the latter part of the night. Penn would narrowly take out the Southern Stump & Mulching Services Shootout, with his Ford Falcons powerplant showing signs of distress. Nine cars faced the starter for the main event with Penn leading the early laps where he immediately faced extreme pressure from Noakes and Calon Ball who was enjoying a strong showing. 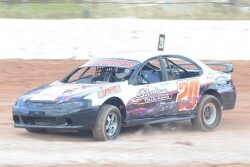 Shortly after Branden Fraser, Paul Stevens and Allan Mortimer came into the battle for the lead with the six cars racing in close proximity around the Narrogin venue. Matt Noakes would hit the lead momentarily on lap twelve with Penn fighting his way back past the former WA Modified Sedan champion with the battle for the first six places really starting to intensify. With four laps remaining Calon Ball would make a tremendous outside pass around both Penn and Noakes as they battled for the lead. Brett Mills hit the wall in turn three with two laps remaining leading to the only stoppage of the night for the Modified Sedans. Calon Ball lead the field to the green light with Noakes finding a way past Ball as they raced to the white flag. Matt Noakes would go on to win his third feature race of the 2018/2019 Cranecorp WA Modified Sedan Series defeating Ball, Penn, Paul Stevens, Branden Fraser and Allan Mortimer. The final round will be held at the Moora Speedway on Saturday 6th April 2019 which will double as the Moora Automotive Midwest Magic. © 2017 Speedway Sedans Australia Inc. All rights reserved.